Howard Holden (#41) passes Jo Jo Stearns (#6) and Mikala Stearns (#20) three wide on his way to his big win at Madera Speedway. 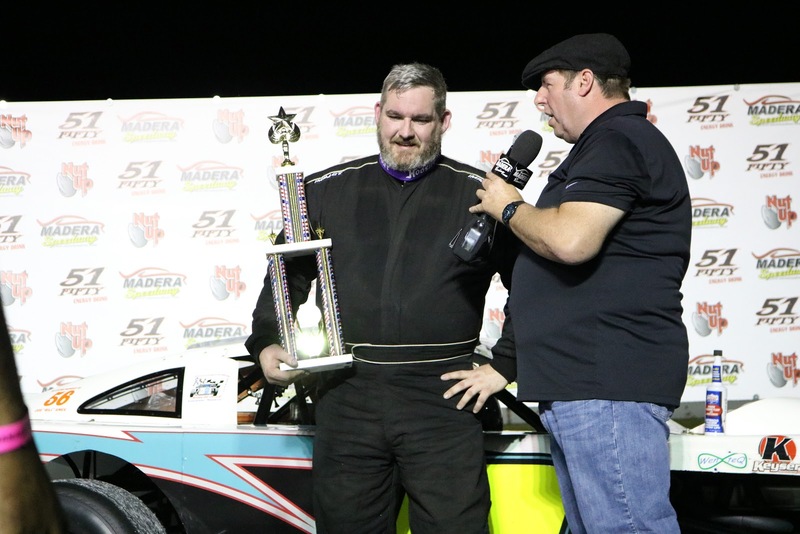 Madera, CA..... April 13, 2019.... Madera Speedway and the North State Modified Series partnered up to create the NSMS Street Stock / Madera Hobby Stock division for 2019. Saturday night was the inaugural event for this class, and when it was all over the night belonged to Howard Holden of Clovis. Holden set fast time of 16.185 seconds over the nine-car field and led the last 23 laps of the Gone Fishin' Marine 50 lap feature to pocket $750 for his impressive win. Steve Schermerhorn of Oakhurst finished second, Chuck Dozhier of Tracy was third, Triston Hansen of Auberry fourth, and Stockton's Mikala Stearns fifth. Dozhier was the $100 winner of the Buckhorn Bar & Grill Dash for Cash. Holden collected $50 for second place. The fully inverted field saw Rodney Tripp and Triston Hansen share the front row for the feature, and when the green flag dropped Tripp bolted out into the lead. Schermerhorn came from fifth starting to steal the lead on the second go-round, and both Richard Herzog and Holden drove around Tripp on lap three. Hansen and Dozhier moved into fourth and fifth on the fifth circuit as the top three were driving away from the pack. Jo Jo Stearn dropped out with engine problems on 16. The race was slowed on lap 18 when Hansen spun in turn two. Herzog spun in his own oil the following round and retired to the pits with a blown engine. Dozhier took over the lead on the restart and stayed there until lap 27 when Holden snuck under him here they ran side-by-side for six laps before Holden made the winning pass. The remainder of the race went without incident with Holden taking the win over Schermerhorn, Dozhier, Hansen and Mikala Stearns. The next NSMS Street Stock / Madera Hobby Stock will be on June 15 at Madera Speedway. Madera, CA..... April 13, 2019.... After setting fast time of 15.072, Randy Houston of Medford, Oregon started 10th in the field and collected $2000 for his big win at Madera Speedway Saturday night in the season opener of the North State Modified Series, presented by Protect the Harvest. Sacramento's Jason Philpot finished a strong season, and a race-long battle between Cameron Austin of Santa Rosa and Darrin Sullivan of Kelsyville saw Austin beat Sullivan to the Sunoco checkered flag for third with Sullivan settling for fourth. Brian Collins of Camino finished fifth. The 60 lap feature saw Dave Campbell and Oregon driver Rich Cobb in the front row with Collins and 3-time NSMS champ Darrin Knight in row two. 2018 champion Kris Price and Austin shared row three. Cobb powered to the lead at the drop of the green flag with both Knight and Collins passing Campbell for second and third. Collins got around Knight on lap seven just before the yellow flew when Campbell and Ian Elliott made contact causing Campbell to spin in turn one. When racing resumed Cobb continued to show the way with Collins second, Austin third and Price fourth. 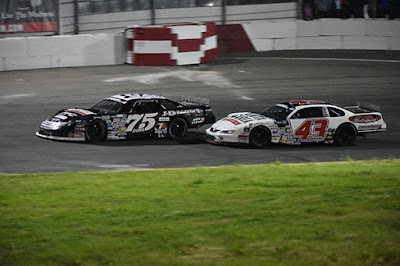 Collins took over the lead on lap 12, and two rounds later Price made an inside pass on Collins and began to pull away from the field. Knittel got around Cobb for third on lap 18 and Philpot joined the front runners on 21. Meanwhile Houston was picking off cars, and at the half-way mark it was Price, Knittel, Philpot, Houston, Austin, Collins, Sullivan, Cobb, Knight, Keith Bloom, Elliott, Campbell, Donovan Cox, Rick Avila and Sal Lopez. After a long green-flag run, the race was slowed again when Lopez's car bobbled and he spun in turn two. The restart saw Price and Knittel side-by-side, but when they motored down the back stretch, the two cars touched with Knittel brushing the wall and Price's car hitting the wall hard, ending his run. Knittel pitted for a tire change and rejoined the field to finish the race. This left Philpot and Houston side-by-side for the restart with Houston taking the next two laps to inch by Philpot and into the lead. The final yellow flew on lap 54 when Bloom and Cobb made contact with Cobb turning around in turn four. Houston raced the remaining laps flawlessly to take the win over Philpot, Austin, Sullivan, Collins and Knight. Rounding out the top 10 were Elliott, Knittel, Cobb, Bloom and Campbell. The $1000 win was boosted to $2000 courtesy of Madera promoter Kenny Shepherd. Kris Price collected $100 for his win in the Lucas Oil Dash for Cash with Philpot earning $50 for second. Arce Racing Engines donated $50 each to third place Houston and fourth place Knittle. The Keyser Hard Charger award went to Houston for passing the most cars. Donovan Cox picked up the Naake Shocks certificate, Price and Philpot earned the Scribner jugs, and the Frank's Radios gift cards went to Houston, Philpot and Austin. Racing resumes for the North State Modified Series on April 27 at the Stockton 99 Speedway. The North State Modified Series is presented by: Protect the Harvest, Lucas Oil, Hoosier Tire West, Sunoco Race Fuels, Naake Suspension, Five Star Bodies, Racer Bling, Keyser Racing Products, Scribner Plastics, Gone Racin' Marine, Buckhorn Bar & Grill, and Franks Radios. 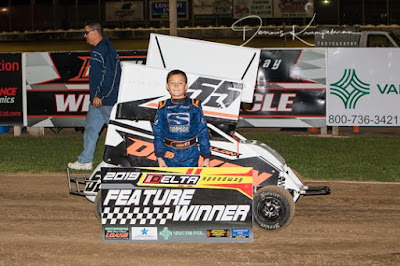 STOCKTON, CALIFORNIA (April 15, 2019) – The second night of championship competition at Delta Speedway presented by Financial Center Credit Union hits the track on Saturday night. Close racing across all four regular divisions – Super 600, Non Wing, Restricted, and Jr. Sprints – is expected to continue after a hotly contested opening night. Drivers compete on a 1/7th mile dirt oval located at the San Joaquin County Fairgrounds in Stockton. Non Wing has maintained its place as the largest division at the speedway with an average field of 33 so far in two events. Both main events have been won by the brand-new Ten-J Chassis, with veteran drivers Mitchel Moles and Brandon Carey behind the wheel. 2018 champion Tj Smith with his new Driven chassis and 2018 runner-up Caden Sarale have been locked out of victory lane thus far. Former champion Dan Mognaga has a pair of top-fives so far in the $500 to win, 30 lap features. Super 600 saw a bit of a redemption story in the points opener when 2018 championship runner-up Raio Salmon scored the victory. Former track champion Jake Andreotti finished second ahead of 2012 Turkey Bowl winner Brad Hannum. No driver has finished in the top-five in both races, showing the competitiveness of the class. Super 600 also competes for $500 to win for 30 laps. Logan Trevino has had a brilliant start to his 2019 Restricted campaign with a victory and a second place finish. His victory came ahead of Jeffrey Pahule, Jr. on the first points race while his runner-up was behind Jade Avedisian in the non-points special in March. Both Pahule and Avedisian are poised to compete for victories all season long. Reilee Phillips is entering his first full season of Restricted and posted a career best third on opening night as well. The young drivers in Restricted will compete for 25 laps for a minimum of $300 to win. Jr. Sprints has attracted a surging turnout with 17 cars for their points opener. Lucas Mauldin earned a well-deserved first career victory over Colton Key. Kyle Fernandez has been third in both events this year. The Jr. Sprints will race for 20 laps and a guaranteed $200 to win on Saturday. Pit gates open at noon with the drivers meeting set for 4:30 p.m. Hot laps begin shortly after with qualifying and racing to follow. Race fans are invited to come early and stay late for great Royce Farms BBQ as well! For more information on Delta Speedway presented by Financial Center Credit Union, follow us online at www.deltaspeedwaystockton.com or on Facebook, Twitter, and Instagram. Delta Speedway presented by Financial Center Credit Union also thanks Interstate Truck Center, Lovotti Air, Van De Pol Petroleum, Von Euw Trucking, Starr Property Management, Performance Electronics, Price Rite Restaurant Equipment, Genova Bakery, Bruno’s Peppers, and Panella Trucking for their support.